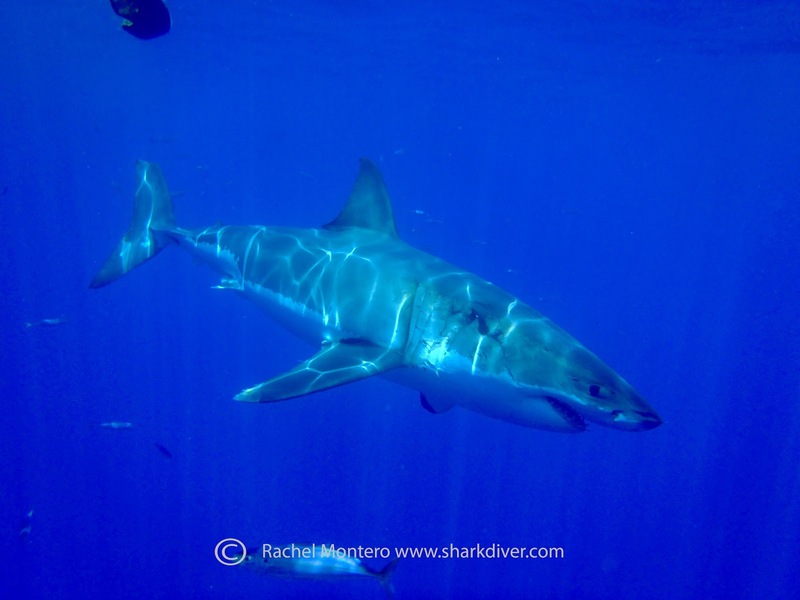 Shark Diver : Shark Diving : Swimming With Sharks: How fast do Great White Sharks heal? How fast do Great White Sharks heal? 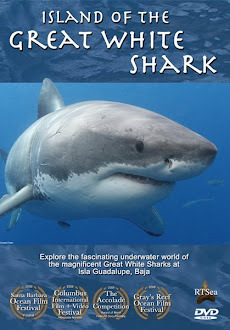 This is my 13th season at Isla Guadalupe, diving with and observing Great White Sharks. During this time I have learned a lot and found out that I now know a lot less about these sharks than I thought I knew when I started out, all these years ago. 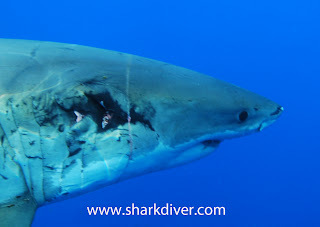 It is scary to think that Great White Sharks are an apex predator in the Ocean and we know very little about them. 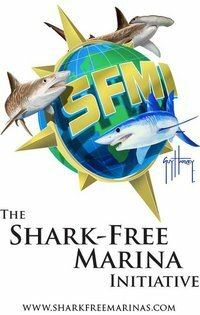 A few years ago I heard a quote by Dr. Peter Klimley, probably one of the most respected and knowledgeable scientists, when it come to Great White Sharks. "You want answers?! I got questions!" I thought that was a funny response at the time, but now I'm starting to understand what he meant by that. For every answer I get, a few more questions arise and so I feel like I know less and less as I'm becoming aware of all the things I don't know. Take for example how sharks heal. The first picture is of "Chuggy" last year, after he got bit by another shark. He was swimming around with this nasty gash on his head, like he did not have a care in the world. I have to admit that I didn't think much of his chances to survive this bite and thought I'd never see him again. The second picture was taken just last week. Look at the amazing difference! There are no veterinarians, no surgeries or stitches and yet he looks like he's healing just fine. I'm blown away by their ability to survive injuries that would kill just about any other animal and the weirdest thing is, these nasty injuries don't even seem to bother them all that much. They swim by like nothing happened, with no discernible change in behavior or activity. They are not "limping" around, they keep swimming around normally, acting exactly like they did the day before. Could it be that besides the shark having a great recovering ability from the wound, what about the salt water, organisms that may be playing a role in the healing too? I had the same question. My example being that old methods of gurgling with salt water after tooth extraction of infection which, works quite well. That is a good point, but doesn't explain why sharks heal better than other animals in the ocean. This article has some good information on the topic -- although it deals primarily with skin regeneration. It does mention that water-borne bacteria seem to thrive on the mucus generated in/around a shark's wound, and appear to aid the healing process somehow. I recall reading a relevant story in a book: In this case, the author defended himself against a small reef shark one time while spearfishing, and dealt the shark a horrible wound with his speargun (intestines spilling from its body, etc). Somehow he brought this shark back to a tide pool on the shore, in order to observe it. Strangely enough, the shark carried on as if nothing were wrong. For a full three days, he returned to this tide pool to observe the shark – and it continued to swim around, dragging its entrails along with it. On the fourth day the shark was gone – whether escaped or eaten by some land-based predator, he couldn't be sure.